We want to start a hive. We have someone who has a large honey bee nest in the wall of a barn they want to tear down in the spring so we’re getting the things we need so we can get these bees. In the process I have a friend who has several heavy plastic beehives (I may be saying that wrong) that they want to get rid of, however after being in their shed a year wasps invaded, so he sprayed the hives. My question is, are those hives usable if they were to be cleaned or would they carry trace amounts of wasp spray that would harm/kill honey bees? Or would it just be wise to just get new ones? We have no plan yet as to when he will remove the bees from the barn. I’ve just been researching as of yet. My father has transferred/rescued bees before and said he could help so I was leaning towards his knowledge there. I’ve only started researching the last two weeks and ran into your advice column so I wanted to see what advice I could get. Unless cost is a major consideration, I suggest that you purchase new equipment. Scrubbing the plastic hives with soap and water, might be enough to remove any pesticide residues, but do you really want to take a chance? Wasps, like honey bees, are insects, and pesticides designed to kill the one are not likely to be healthy for the other. The level of risk to any colony you install in the hive would depend on such factors as: the toxicity of the active ingredient of the product, the half-life (or rate at which that product breaks down), the amount applied (Did the owner spray the equipment lightly or really wet it down? ), and your ability to eliminate any remaining chemical. Since you know the person who sprayed the hive, you might be able to find out the name of the product used and do some research, but there will probably still be unknowns in the end. My concern is that, if you should decide to clean and reuse the plastic equipment, you might not recognize any possible negative effects when they occur. It isn’t just a question of whether or not there is enough chemical residue to kill the bees. Pesticides can, in small quantities, produce what scientists call sub-lethal effects. In other words, though they may not kill, they could impair in such a way as to make the colony more vulnerable to other stresses. As a novice, you wouldn’t have any way of knowing that things weren’t right. One of the difficulties new beekeepers contend with is recognizing when something is abnormal in their hives, because they haven’t learned yet what normal looks like. Tossing in another unknown can only make the challenge more difficult, or at minimum give you something else to worry about. One way to mitigate the problem would be to purchase a second hive in a more conventional manner, and install a nuc or package of bees in it. I always recommend that people start with two hives when feasible. This allows you to compare one with the other. Similarities in the two new hives likely mean things are going well in both. Serious differences may indicate that something is wrong with one, and prompt you to get help and advice from someone more experienced. Chemical residues are not the only reason for new beekeepers to be very careful about buying used equipment. They just do not have the experience to judge its condition. This is partly a question of value, which may not be an issue for you if you expect to get the plastic hive body at low cost or as a gift. Also, plastic is not prone to rot and deterioration as wood is. The other issue with used equipment is the risk of its harboring disease pathogens. 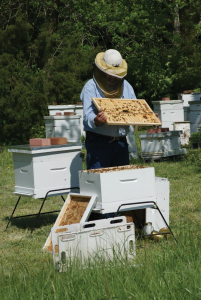 Even an experienced beekeeper would not recognize the pathogens in equipment that cause nosema disease, or have difficulty recognizing signs of a mild case of American foul brood. To some extent one has to rely on the seller’s word and reputation. Disease issues are most likely in used frames, especially those containing comb, so I advise new beekeepers to always stay away from them. I am glad you have someone with experience to help retrieve the colony from the barn. 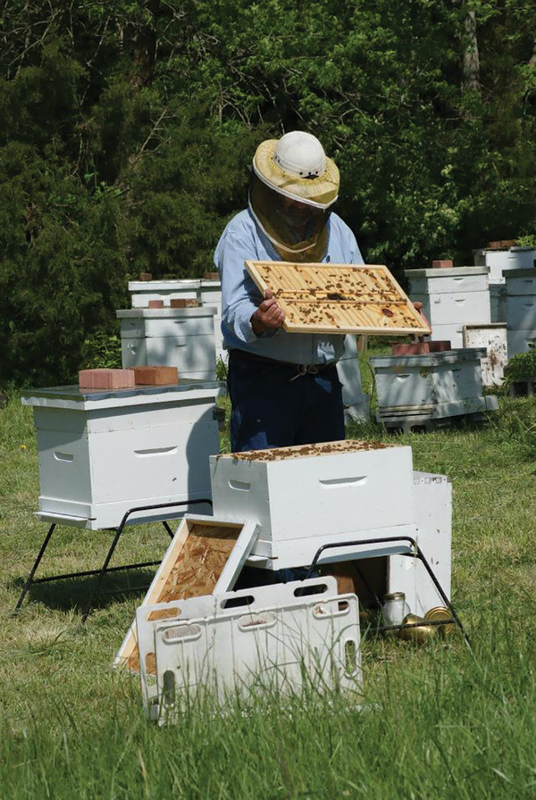 Removal is a task a veteran beekeeper might handle successfully without any prior expertise, but for a new beekeeper to attempt it is to invite an unpleasant experience, or even a dangerous one. Spring would be the best season to undertake it, though the timing depends on the weather in your area. At my old Kentucky home, the best period would probably be around the 1st of May. Depending on your elevation in Idaho, I would suggest late May or early June for you. The goal is to remove the colony after it starts to build up, but before it increases too much. Better not have a lot of fresh honey to deal with. 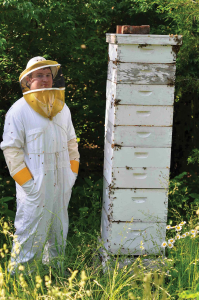 I am always interested in people’s stories about how they got started in beekeeping. You have a lot of research to do before spring, but seizing an accidental opportunity is as good a way as any to begin. Let me know how it turns out. 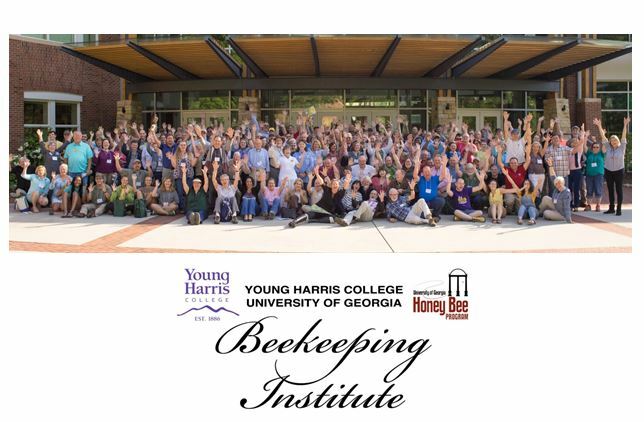 Bee Culture readers, if you would like a copy of my handout: “Getting Honey Bees and Getting Started”, drop me an email, or a note, and I will send it to you. Hope you are doing well. My question is, I had five boxes on my hive all Summer, two were honey supers. At the end of Sept I took off the two honey supers. I took them down to three because I saw wax moths, but within two weeks I felt they were overflowing out of the box, so I put one back on. Now at four boxes. How can you go from five boxes down to three and the bees still have sufficient room? How do you know how many boxes to take it down to for Winter? Also, for each solid box of bees you have, how many boxes of honey do they need for Winter? Is there an equation or ratio? 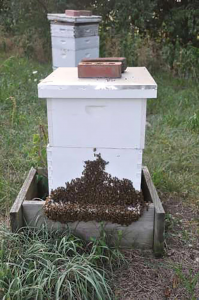 Removing honey supers during harvest might cause crowding in a hive, but it’s not necessarily the case. Obviously, it depends on the number of bees in the colony, but the time of year is also a factor. If the supers you took off were full of capped honey, which is most often the case during harvest, there might not have been very many bees in them. There is not much for them to do once honey is capped – no wax comb to be constructed, no nectar to move around, no cells filled with honey to be capped. At that point, most of the bees will move back down into the brood boxes or into other honey supers where there is still work to be done. 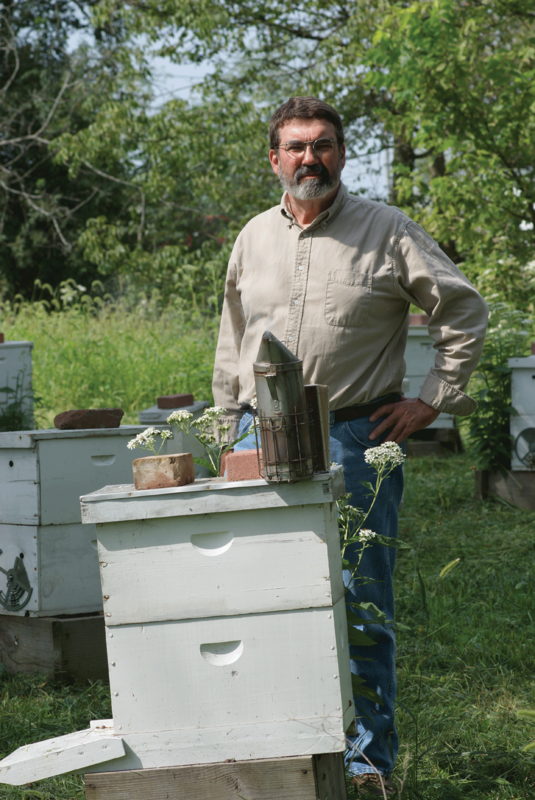 Frequently, after removing several supers of capped honey from a hive in late Summer, I have seen an immediate increase in bearding at the entrance. That can be a sign of congestion in the hive, but if the weather is warm I don’t worry about it. The bees are fine out on the porch, and they will move back inside when it gets chilly. If there is still a nectar flow on when I notice the bearding, I will put an extracted super back on the hive. That both takes care of the lack of space and garners me a little more honey. The bottom line is that, when you are concerned about crowding, the sensible thing to do is to give the bees more space by adding an empty box just as you have done. A super with undrawn foundation will do, even in a dearth. If the bees are going into the super because of crowding, it doesn’t matter whether or not they have work to do. The changing of the season brings a more permanent solution, at least in your part of the country. In late September it was still quite warm in West Virginia. As I write this reply in mid-November it has cooled considerably, and the bees are clustering to stay warm. It would not be surprising to find that the box you put on to reduce crowding in September is now empty. Lower night time temperature is the reason that bee escapes are effective late in the fall at clearing honey supers of bees. Workers occupied in the supers leave them to join the cluster in the brood chamber at night when the temperature drops. As the sun warms the hive the next day, the one way door prevents them from moving back up. Bee escapes are of little use in hot weather because bees have no reason to leave the supers when night time lows are in the 70s or 80s. As to how many boxes of honey the colony needs, there is no equation or ratio. It all depends on the severity and duration of Winter in your area. 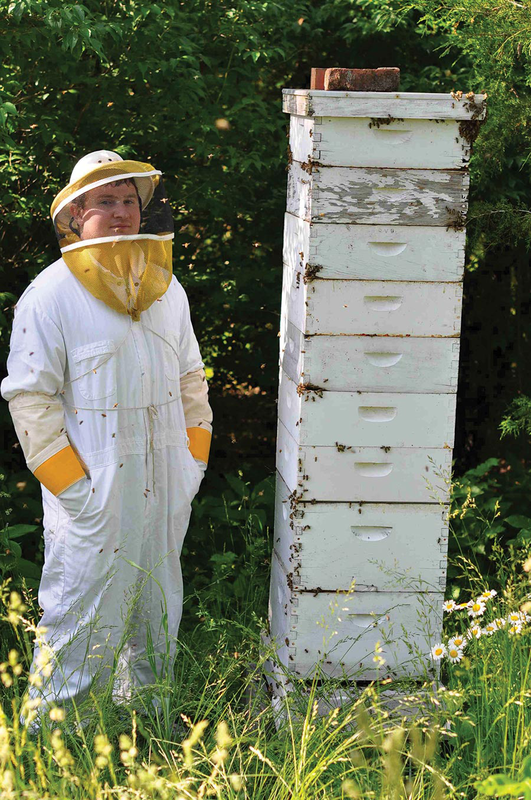 Beekeepers relate the pounds of food stores required to a certain number of frames or boxes, which in turn varies with the size of your hive bodies (standards, mediums, and so on.) 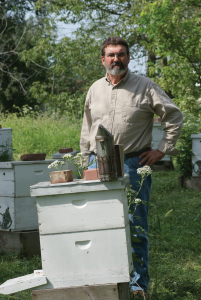 No formula works for all parts of the country; the best guides are your local bee inspector and the experience of other beekeepers in your area. As you know, I live and keep bees in central Kentucky which is similar in climate to West Virginia. Here we consider about 50 to 60 pounds of stored honey (including sugar syrup if the beekeeper has been feeding) sufficient to get through the Winter. A little more would provide a safety margin for hives located at mountain elevations. That is a probably a fair average in the contiguous states, but it is only the middle of a range. Beekeepers in the deep South can get by with as little as 25 pounds of honey, and those in the far North need as much as 100. Alaska is in a separate category. 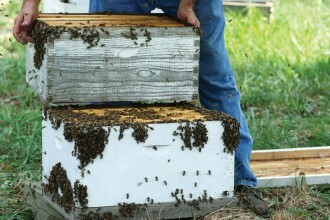 Hives there may require 190 pounds of food as well as special preparations such as wrapping or wintering indoors. 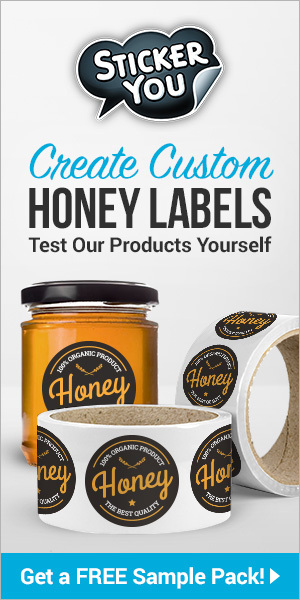 Short of putting your hive on a scale, how can you determine what weight of honey it contains? There is a formula for this part. A standard frame full of capped honey or syrup weighs about 7.5 pounds which comes to 75 pounds for a full deep box with 10 frames. Shallow boxes and frames weigh about half of that, and mediums about two thirds as much. I maintain my hives with two deep brood boxes each, and I like to see the top ones completely or nearly full going into Winter. A strong colony should be able to store that much easily, and if for some reason they don’t, there’s always the option of feeding with sugar syrup. I’m inclined to think that you have more boxes than you need. I would be quite surprised if the bees were occupying or storing much honey in the super, and even the third hive body is probably superfluous. However, there is no harm in leaving them in place as long as the wax moths are not back at work. Please be assured that your carefully composed writing each month in “ASK PHIL” is appreciated. However as you probably have already been informed, the statement “That all drones produced by one queen are genetically identical” (Bee Culture, Oct 2016, pp 40-41) is false. Please see Page and Laidlaw in The HIVE and the Honey Bee, Joe M. Graham, ed, 1992 pp 242-4, portions of which I quote here. “Different eggs laid by a (honey bee) queen contain different genomes, due to genetic recombination during maturation of the egg, and the sperm produced by males derived from different eggs of the same queen will differ accordingly. Perhaps, what you were intending to write was that “all of the sperm that one drone produces contain identical genomes (with the exception of random mutations )“ as quoted from page and Laidlaw, p243. Whereas I normally use the formula “A beekeeper in _______ writes:” to avoid disclosing the names of those who write in to my Bee Culture column, I will make an exception this time. This is not a beekeeper asking a question, but a friend doing me a favor. I try to be as accurate as possible, and if I don’t have a ready answer, I do research to find one. However, when I make a mistake, I appreciate someone’s setting me straight – especially when they do so in such a polite manner. So thank you Fredrick Burdell. I hope I don’t require fact checking as often as some of the candidates in the recent presidential debates, but if I do err again in the future, I hope you’ll let me know.